As NASA seeks cost-effective access to destinations across the inner solar system, including cislunar space and Mars, it also seeks to shorten the cycle of time to develop and infuse transformative technologies that increase the nation’s capabilities in space, enable NASA’s future missions and support a variety of commercial spaceflight activities. 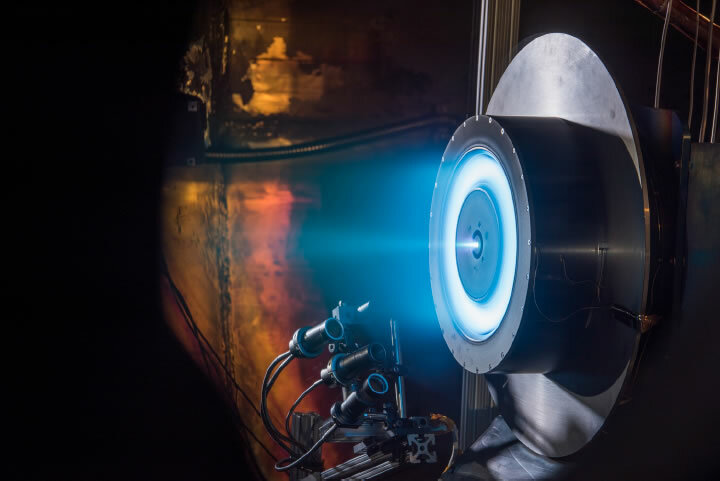 NASA’s Solar Electric Propulsion (SEP) project is developing critical technologies to extend the length and capabilities of ambitious new science and exploration missions. Alternative propulsion technologies such as SEP may deliver the right mix of cost savings, safety and superior propulsive power to enrich a variety of next-generation journeys to worlds and destinations beyond Earth orbit. Energized by the electric power from on-board solar arrays, the electrically propelled system will use 10 times less propellant than a comparable, conventional chemical propulsion system, such as those used to power the space shuttles to orbit. Yet that reduced fuel mass will deliver robust power capable of propelling robotic and crewed missions well beyond low-Earth orbit — sending exploration spacecraft to distant destinations or ferrying cargo to and from points of interest, laying the groundwork for new missions or resupplying those already underway. Mission needs for high-power SEP are driving the development of advanced technologies the project is developing and demonstrating including large, light-weight solar arrays, magnetically shielded ion propulsion thrusters, and high-voltage power processing units. 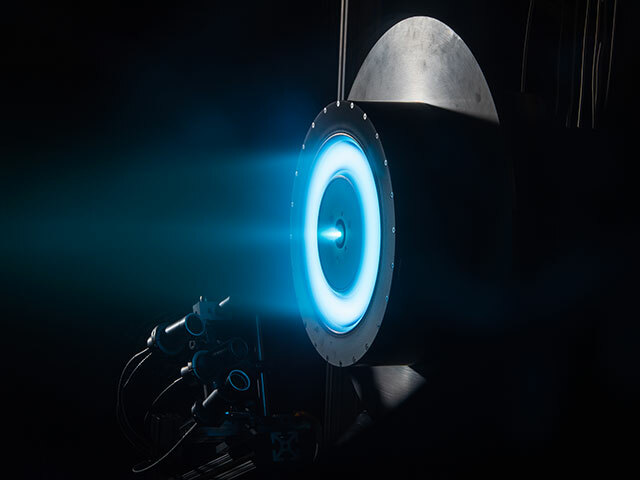 NASA’s Glenn Research Center in Cleveland leads the Solar Electric Propulsion project for the agency and is preparing a system-level flight demonstration. 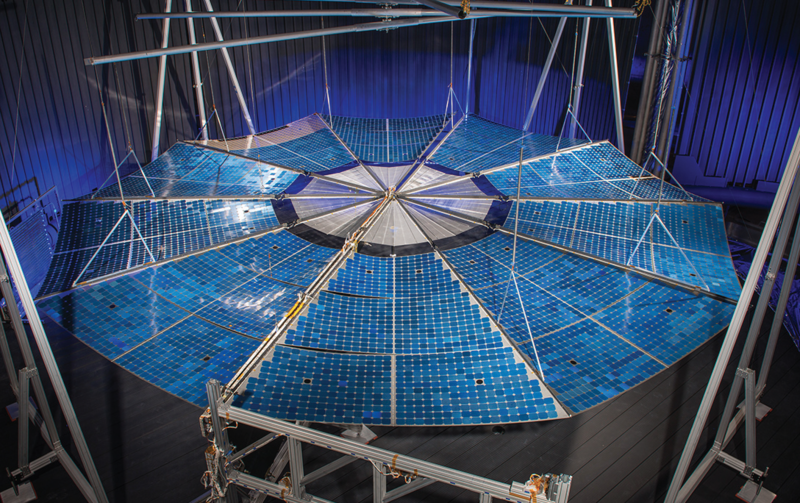 During the technology maturation period — under the auspices of NASA’s Game Changing Development Program, prior to transitioning to the Technology Demonstration Missions Program — the SEP project began developing large, flexible, radiation-resistant solar arrays that can be stowed into small, lightweight, more cost-effective packages for launch. After launch, they unfurl to capture enough solar energy to provide the high levels of electrical power needed to enable high-powered solar electric propulsion. 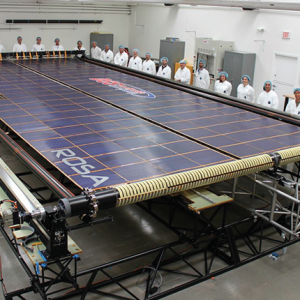 The SEP project worked with ATK Aerospace and Deployable Space Systems Inc. to build and test two solar array designs: one that folds out like a fan (ATK MegaFlex) and another that rolls out like a window shade (DSS ROSA). Both use lightweight structures and flexible blanket technology and are durable enough to operate for long periods in Earth orbit or passing through the punishing space environment, including the Van Allen radiation belts. Both arrays achieved all state-of-the-art-related goals including four times the radiation tolerance, 1.7 times the power per mass (kW/kg), four times the stowed volume efficiency, and over twenty times deployed strength. Subsequent commercial infusion of solar array technology includes Orbital ATK using a smaller version of similar technology to Megaflex on the Cygnus cargo vehicle to ISS; Space Systems Loral and Deployable Space Systems flight qualifying a 12.5 kW ROSA for use on Loral’s commercial satellites; and, a recent ROSA flight experiment on ISS successfully completed its science objectives unfurling for the first time on-orbit and measuring structural dynamics and power generation performance. 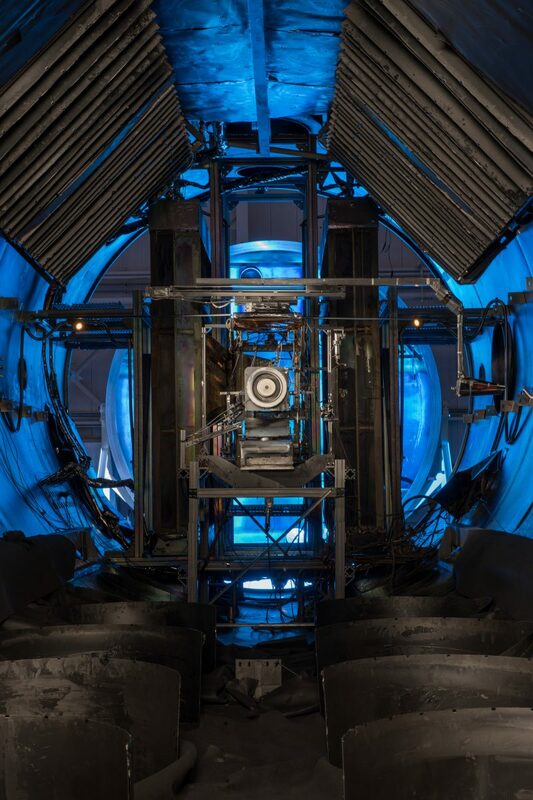 The SEP project will use electrostatic Hall thrusters with advanced magnetic shielding instead of a rocket engine with conventional chemical propellant. 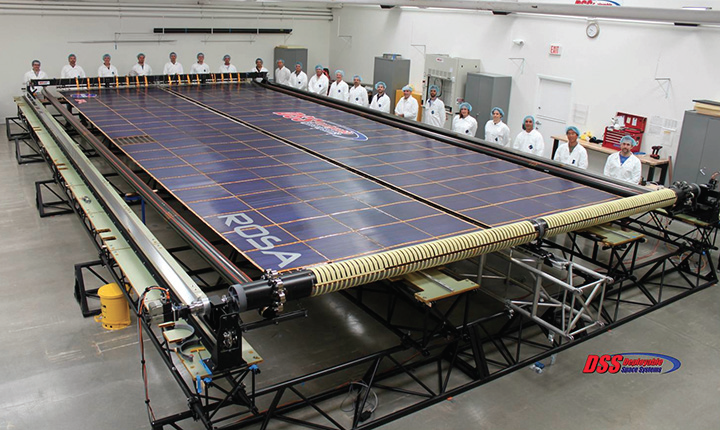 With SEP, large solar cell arrays convert collected sunlight energy to electrical power. 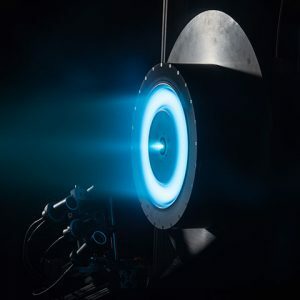 That energy is fed into exceptionally fuel-efficient thrusters that provide gentle but nonstop thrust throughout the mission. 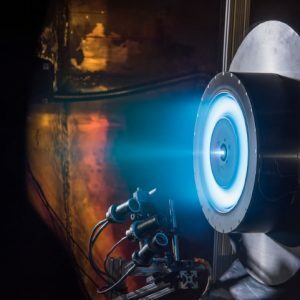 The thruster traps electrons in a magnetic field and uses them to ionize the onboard propellant — in this case, the inert gas xenon — into an exhaust plume of plasma that accelerates the spacecraft forward. Several Hall thrusters can be combined to increase the power of an SEP spacecraft. 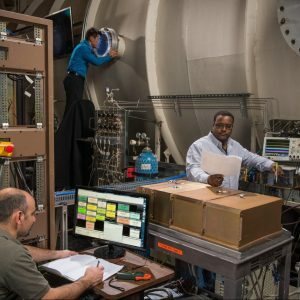 Such a system can be used to accelerate xenon ions to more than 65,000 mph and will provide enough force over a period of time to move cargo and perform orbital transfers. 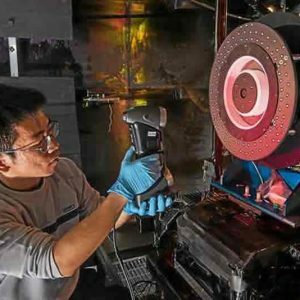 In fiscal year 2015, researchers successfully tested a new 12.5-kilowatt Hall thruster that employs magnetic shielding, enabling it to operate continuously for years — a capacity important to deep-space exploration missions. 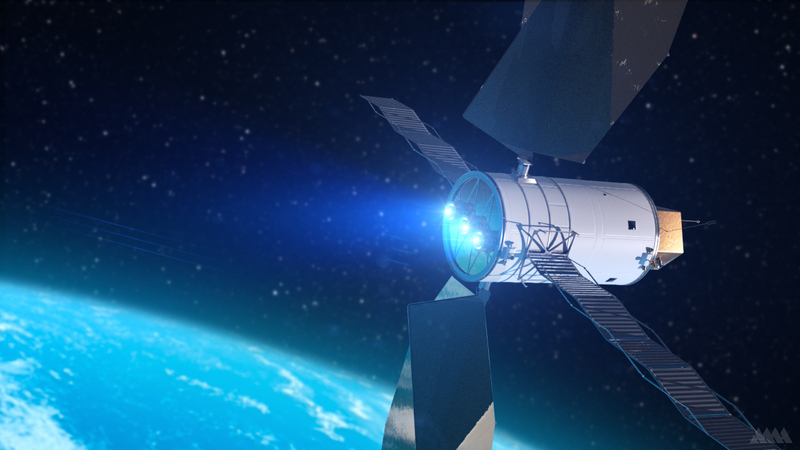 The Solar Electric Propulsion project will demonstrate the key technologies necessary for robotic and human exploration-class SEP transportation systems as well as highly efficient orbit transfer capabilities for commercial space operations and science missions. This effort will benefit not only NASA missions – including new highly capable science missions and human missions to Mars — but can provide more affordable primary power and more efficient orbital maneuvering and station-keeping capabilities for commercial communications satellites. 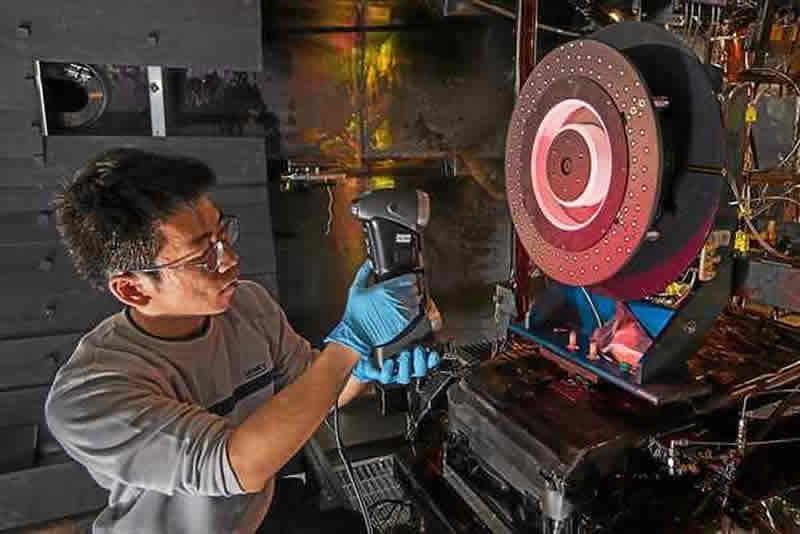 NASA Glenn also recently awarded a contract to Aerojet Rocketdyne for development of a high-power Hall thruster, power processing unit, and xenon flow controller to be used on SEP missions. 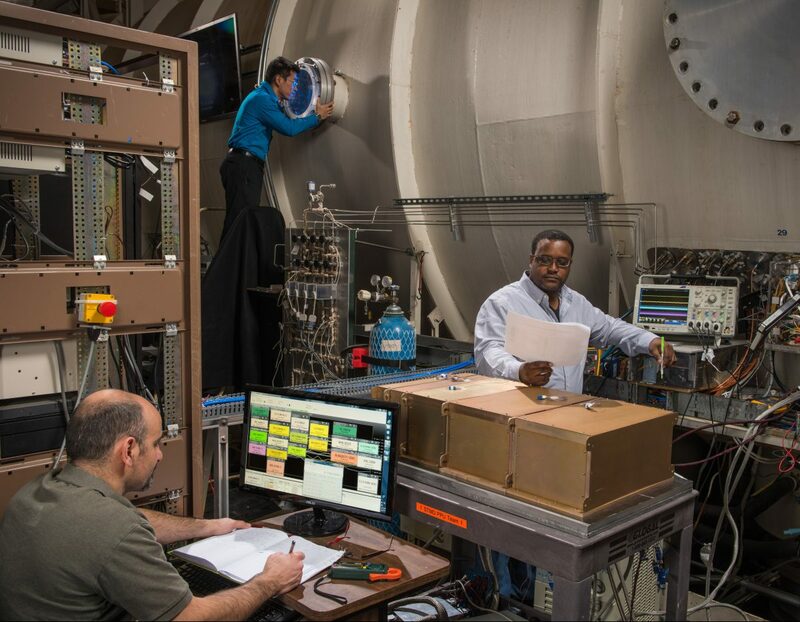 Aerojet and NASA successfully conducted a series of hot-fire tests to demonstrate stable operation and characterize performance of Aerojet’s Power Processing Unit discharge module, a key PPU assembly. 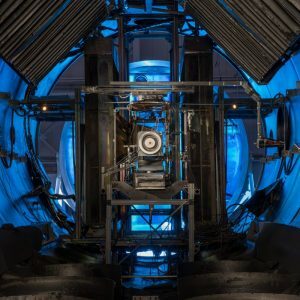 NASA will demonstrate a Solar Electric Propulsion system in flight, launching a spacecraft to validate the technology and hardware for a high-energy, orbit-transfer mission. Enable higher performance Low Earth Orbit (LEO) to geosynchronous-Earth-orbit (GEO) transfers as well as a number of other near-Earth orbit transfers and station-keeping maneuvers, reusable space tug applications for transfer of payloads and Mars mission scenarios. In the longer term, these technologies will reduce mission costs for NASA interplanetary robotic missions, and will serve as a precursor to higher power systems for human interplanetary exploration. Human and robotic exploration beyond LEO will require enabling capabilities – such as SEP – that are efficient, affordable, and reliable. High-Power SEP technologies enable reduced launch system Delta-V requirements and improvements to the satellite’s mass margin over chemical propulsion. 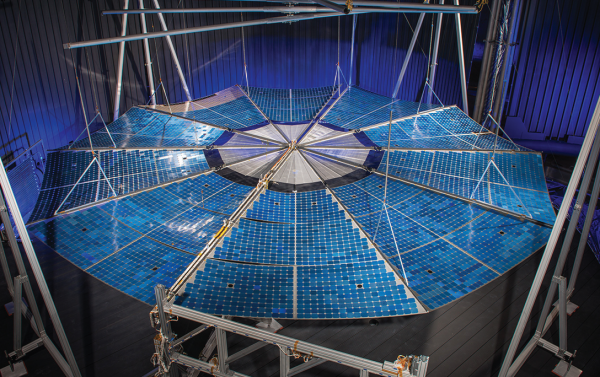 Other government agencies are exploring High-Power SEP technologies to incorporate into future spacecraft acquisitions. Other government agencydemonstrations would be designed to mitigate key component and integrated system-level risks to promote High-Power SEP into programs of record. Furthermore, there is potential for collaboration with NASA on the maturation of these SEP technologies. TheAsteroid Impact and Deflection Assessment (AIDA)mission concept is an international collaboration among theEuropean Space Agency (ESA), NASA,Observatoire de la Côte d´Azur (OCA), and the Johns Hopkins University Applied Physics Laboratory (JHU/APL). 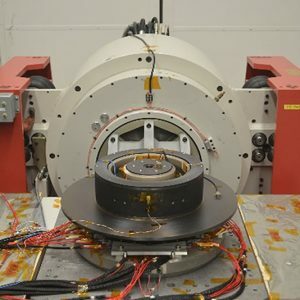 AIDA will be the first demonstration of the kinetic impact technique to change the motion of an asteroid in space. AIDA is a dual-mission concept, involving two independent spacecraft – NASA’s Double Asteroid Redirection Test (DART), and ESA’s Asteroid Impact Mission (AIM). The DART mission is in Formulation Phase A, led by JHU/APL and managed by the Planetary Missions Program Office at Marshall Space Flight Center for NASA’sPlanetary Defense Coordination Office. AIM, managed by ESA’sEuropean Space Research and Technology Centre (ESTEC)is in Preliminary Definition Phase B1. AIDA is a science-driven test of one of the technologies for preventing the Earth impact of a hazardous asteroid: thekinetic impactor. AIDA’s primary objective is to demonstrate, and to measure the effects of, a kinetic impact on a small asteroid. Its target is the binary near-Earth asteroid (65803) Didymos, which consists of a primary body approximately 800 meters across, and a secondary body (or “moonlet”) whose 150-meter size is more typical of the size of asteroids that could pose a more common hazard to Earth. The CAESAR mission seeks to return a sample from 67P/Churyumov-Gerasimenko, a comet that was successfully explored by the European Space Agency’sRosettaspacecraft, to determine its origin and history. Led by Steve Squyres of Cornell University in Ithaca, New York, CAESAR would be managed by NASA’s Goddard Space Flight Center in Greenbelt, Maryland. By using SEP, geostationary telecommunications satellites (geocomsats) are able to generate on average $50M-$150M in revenue annually, and increase operational lifetimes from 7-8 years to 12-15 years by using SEP for North-South station keeping. Such commercial spacecraft, by using 30-50kW class SEP, will become sufficiently lightweight for two of them to be co-manifested on a single Falcon 9 launch vehicle. 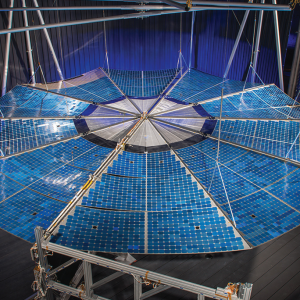 With the introduction of high-powered SEP, there is increasing pressure for satellite manufacturers to adopt this approach across their entire fleet of spacecraft when higher power solar arrays and electric propulsion systems become available. This is because 60% of the wet mass of large geocomsats is typically associated with the bi-propellant chemical propulsion system used for the Geostationary Transfer Orbit (GTO) to Geostationary Orbit (GEO) transfer. 30-50kW of onboard power is sufficient for reasonable GTO-GEO trip times using SEP for even the largest commercial spacecraft, and will therefore enable additional revenue generating payloads needed to meet the increasing demand for satellite TV (which currently accounts for more than 90% of all satellite service revenues). High-Power SEP is a cornerstone of NASA’s human exploration plans, as part of the Proving Ground missions to move large cargo, payloads, and other spacecraft elements required for crewed exploration beyond low Earth orbit in interplanetary space as part of a multi-use, evolvable space infrastructure. The development of SEP technologies has the potential to improve space transport efficiencies enabling deep space travel. 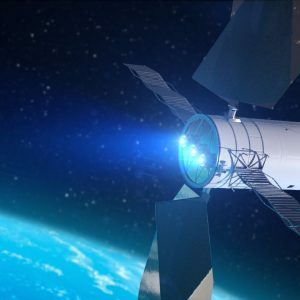 Solar electric propulsion allows deep-space missions to carry more cargo and use smaller launch vehicles while reducing mission costs. 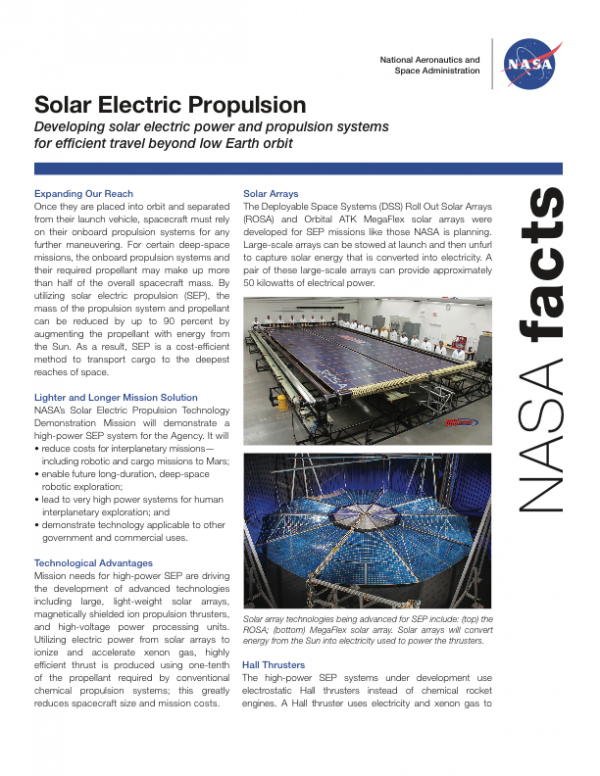 The Solar Electric Propulsion project has developed solar arrays that are lighter, stronger, more compact, and less expensive than those currently available. 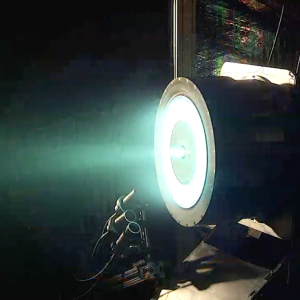 Solar electric propulsion provides such high fuel economy that it reduces the amount of propellant required onboard vehicles for deep-space missions by as much as 90 percent. 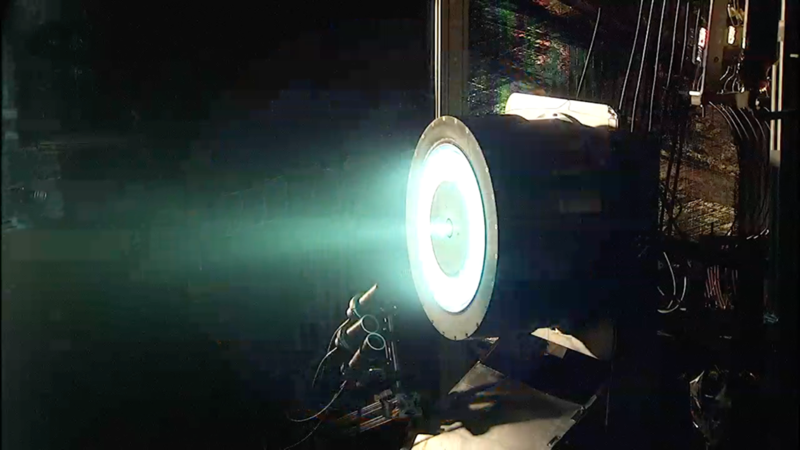 Solar electric propulsion will enable affordable human-crewed missions beyond low Earth orbit. The project is sponsored by NASA’s Space Technology Mission Directorate (STMD) and is managed by NASA’s Glenn Research Center. 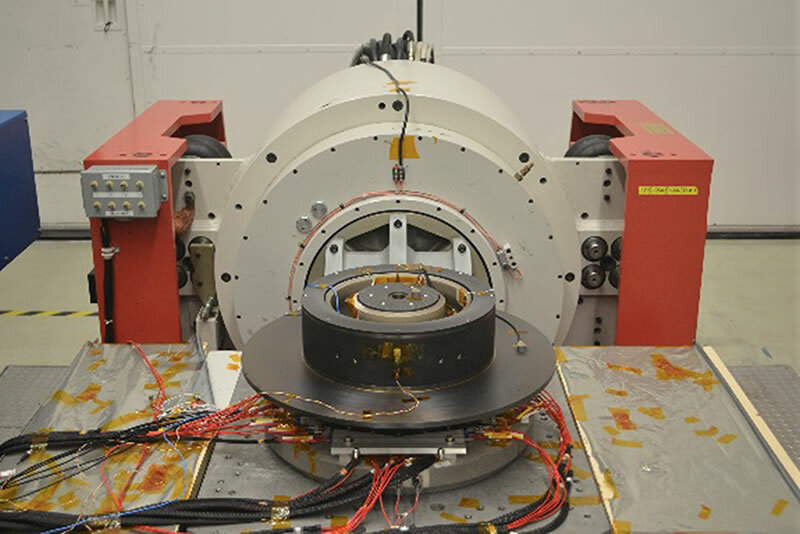 Prototype Hall thruster tested at NASA Glenn. TDU-2 on Vibe Table at JPL.